The leading contender to take control of Poundworld has ended talks about a rescue deal, casting fresh doubt over the future of the struggling high street retailer and its 5,300-strong workforce. Alteri's withdrawal came just days after it had looked poised to clinch a takeover of the chain that would have preserved thousands of jobs despite a proposal to axe more than 100 stores.People close to the sale process insisted on Wednesday that TPG, Poundworld's owner since 2015, remained in discussions with other parties about a solvent deal.Flacks, a US firm which was linked to a bid at the weekend, is not regarded as a serious bidder for the UK-based bargains chain.Chris Edwards, Poundworld's founder, is said to have been attempting to put together a rescue bid for a chunk of the company.If a solvent sale of Poundworld cannot be agreed, the business could be sold through a pre-pack administration or collapse outright, underlining the urgency of rescue talks which are being led by Deloitte, the professional services firm.TPG opted to put Poundworld up for sale last month rather than funding it through a restructuring programme that will involve the loss of about 1,500 jobs.The grim climate on the high street, which has claimed casualties such as Maplin and Toys R Us UK this year, has paved the way for a string of chains to attempt restructurings through a mechanism called a Company Voluntary Arrangement (CVA) - a legally binding agreement with creditors. 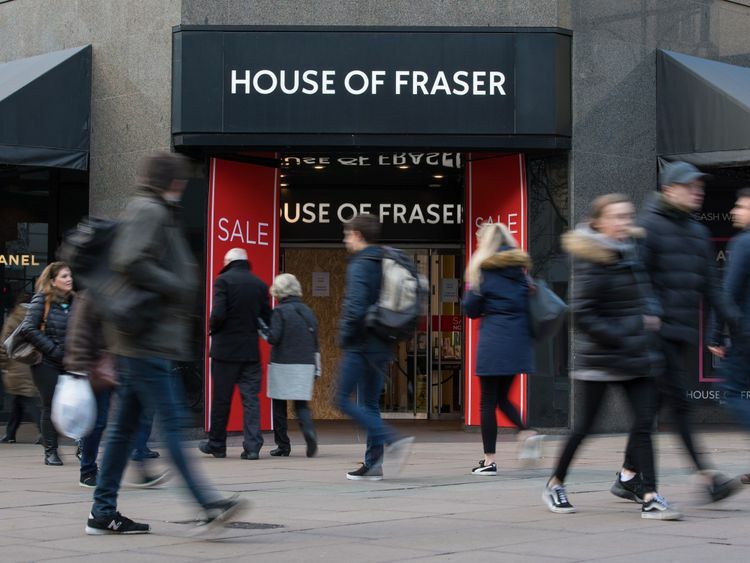 House of Fraser (HoF) is expected to be the latest retailer to turn to a CVA in the coming days amid pressure from its bank lenders on its Chinese shareholder to pump fresh capital into the business. Failure to successfully conclude a deal would probably lead to HoF plunging into administration, although the company insists its plans are "on track".HoF stores employ 17,500 people who either work directly for the company or work in in-store concessions, with roughly half of its 59 outlets said to be at risk of closure.Carpetright, Marks & Spencer, Mothercare and New Look are among the other retailers which have announced store closure plans this year, with thousands of jobs disappearing as a consequence.A CVA at Poundworld would, if approved by creditors, lead to its store estate being reduced to around 250 shops with 4,000 employees.The series of corporate crises on the high street have led the Government to establish a new industry council, jointly chaired by the former Co-op Group chief executive Richard Pennycook, to devise ways of easing retailers' pain. Restaurant chains including Byron, Carluccios and Prezzo - which is also owned by TPG - have also sought approval from creditors to shut scores of outlets amid similarly tough conditions in the UK casual dining sector.Alteri, Poundworld and TPG all declined to comment on Wednesday.